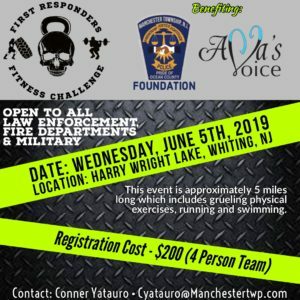 We’re pleased to announce that the Manchester Township Police Department will host the First Responders Fitness Challenge on Wednesday, June 5, 2019, at Harry Wright Lake, located at 1499 Lake Road, Manchester, NJ, 08759. Check-in and walk through will be at 0730 hours, the competition will begin at 0830 hours. Start times will be randomly selected on the day of the event. Each team is responsible to provide one volunteer to assist with the event. Participants must wear a T-shirt, BDU style pants and running shoes or boots. An entry fee of two hundred dollars ($200.00) per team and your completed registration and waiver forms are due prior to May 8, 2019, to reserve your slot. All profits from this event will go to support Ava’s Voice, a foundation supporting individuals and families with Usher Syndrome, and the nonprofit Manchester Township Police Foundation Fund Inc. Agencies may enter multiple teams (may be limited to only two teams per agency). Slots will be filled on a first come first serve basis, and there will be a cut off. Checks should be made payable to the Manchester Township Police Foundation Fund Inc. Completed registration forms and payments should be returned to Ptl. 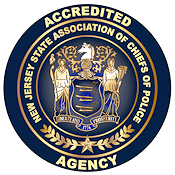 Conner Yatauro at Manchester Township Police Department, 1 Colonial Dr. Manchester, NJ, 08759. If any members of your agency would like to participate in this competition, please contact Ptl. Yatauro at (732) 657-2009 Ext. 6413 or by email at cyatauro@manchestertwp.com. This team-based competition last raised nearly $6,000.00 for Ocean of Love and the Manchester Township Police Foundation, Inc. 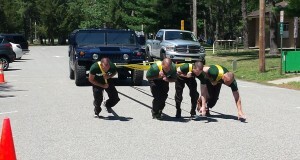 The officers were proud to work together and compete in grueling physical exercises, all for worthy causes. To donate to this cause, please send donations made payable to: Manchester Twp. Police Foundation Fund Inc.
To donate via PayPal please click the button below. Thank you. 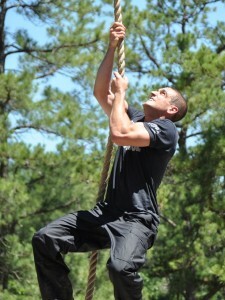 More information and images from the inaugural Elite Law Enforcement Fitness Challenge.